– Professionally framed and mounted to order in high quality wooden frames. – Limited editions, ranging from 50-495. – Individually numbered on reverse with the photographer’s name and the story of the image. – Fixed sizes and pricing provide simple and clear choices. – All orders shipped within 10 working days, express delivery option available. – Hand printed and shipped from either the UK or USA. – Bespoke sizes are available on request. At Sonic Editions we’re committed to providing beautiful products at reasonable prices with fantastic customer service, but don’t just take our word for it – see what our customers have to say on independent review site Feefo by clicking here. Top quality digital C-Type prints on Fuji Crystal Archive Paper. This mode of printing contains elements of both traditional darkroom printing and digital technology. Lambda C-Type photographic technology has taken over from the traditional photographic process and uses three lasers merged into a single beam to expose images on to photosensitive paper. This is then internally “wet” processed in the same manner as traditional photography. All prints are framed with exhibition quality, shatter-resistant perspex, to protect the photograph from damage. Choose from either a black or white hand-made wooden frame. For bespoke framing solutions contact us at bespoke@soniceditions.com. Frame sizes stated are measured on the inside (rebate) of the frame – the same as the outside of the mount. All Mounts/Mattes are acid free archive quality and cut to order. Please note that we cannot be held responsible for any third party ready-made frame not fitting our mounted/ unframed prints. Make sure you measure the mount before ordering any third party frames. We offer as standard small, medium, large or extra-large prints. 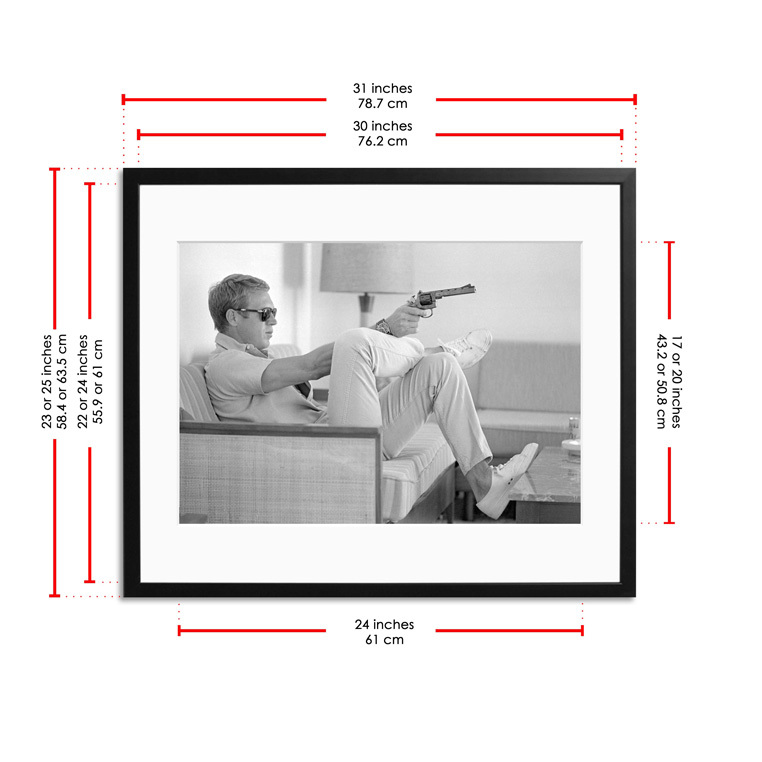 Our sizes listed in the print product description are based on the measurements of the mounted/framed print. Image size depends on the aspect of the original negative. A small print will have an image size of either 7″ x 10″ (17.5cm x 25cm) or 8″ x 10″ (20cm x 25cm). A medium print will have an image size of either 11.2″ x 16″ (28cm x 40cm) or 13″ x 16″ (32.5cm x 40cm). A medium square image will be 12″ x 12″ (30cm x 30cm). A large print will have an image size of either 14″ x 20″ (35cm x 50cm) or 16″ x 20″ (40cm x 50cm). A large square image will be 16″ x 16″ (40cm x 40cm). An extra-large print will have an image size of either 17″ x 24″ (42cm x 60cm) or 20″ x 24″ (50cm x 60cm). An extra-large square image will be 20″ x 20″ (50cm x 50cm). Want a larger size, different frame? No problem, email us at bespoke@soniceditions.com. with your request and we’ll get back to you with prices.